Michael J. Mahoney (1897-1918) was a Marine from New Brighton, Staten Island, who was killed in World War I. Mahoney was one of ten brothers and sisters, and graduated from De La Salle Academy in Manhattan, and St. Peter’s High School in New Brighton. He worked for the Baltimore and Ohio Railroad in St. George before joining the war effort, and served two years in the Calvary Brigade; he then enlisted in the Marines on his 21st birthday. Mahoney served as a private in the 96th Company of the 6th Regiment of the Marine Corps, and fought in five major battles in France. He was mortally wounded while fighting in the St. Mihiel sector, and died October 12, 1918. His body was brought back to the United States, and Michael Mahoney was buried in St. Peter’s Cemetery, in West Brighton. This park was dedicated to Mahoney in 1940, nearly 22 years after his death, with war in Europe again on the horizon. Veterans units, civic units, and North Shore drum corps opened the ceremonies with a parade down Jersey Street. Rev. J.H. Warnhuis, D.D., pastor of the Brighton Heights Reformed Church, gave the invocation, and C. Pennington Baker, commander of the James S. Slosson Post, American Legion, introduced Richard Powers, chairman of the arrangements committee. William Eymer of the James J. Tappen Post, American Legion, sang “The Star Spangled Banner,” accompanied by the Richmond County Legion Band, and Edward Dolan, chaplain of Slosson Post and assistant pastor of St. Peter’s Church, New Brighton, said a prayer. John Mahoney, Michael Mahoney’s oldest surviving brother, then stepped forward and unveiled a bronze plaque honoring his departed brother. Taps were sounded. A three-gun salute was fired by a squad from the Slosson Post. The Commissioner of Borough Works, Cornelius A. Hall, then accepted the playground for the city. A.M. Anderson, Staten Island parks director, accepted the memorial for Parks. Speakers included C. Harry Robillard, former alderman, Harold Speckin, county commander of the American Legion, and Guido Carfagna, the commander of Richmond County Council, Veterans of Foreign Wars, and Father Dolan gave a closing prayer. 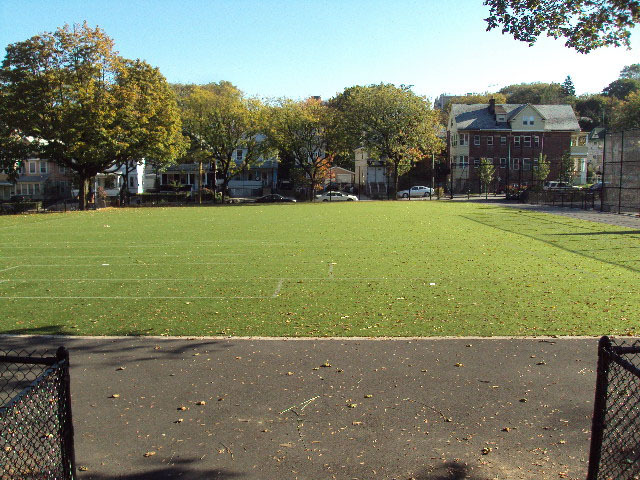 Mahoney Playground is bounded by Jersey Street, Cleveland Street, Beechwood Avenue, and Crescent Avenue, and was transferred to Parks in two parts. The Board of Education acquired the first parcel – 1.61 acres – by condemnation in 1933. 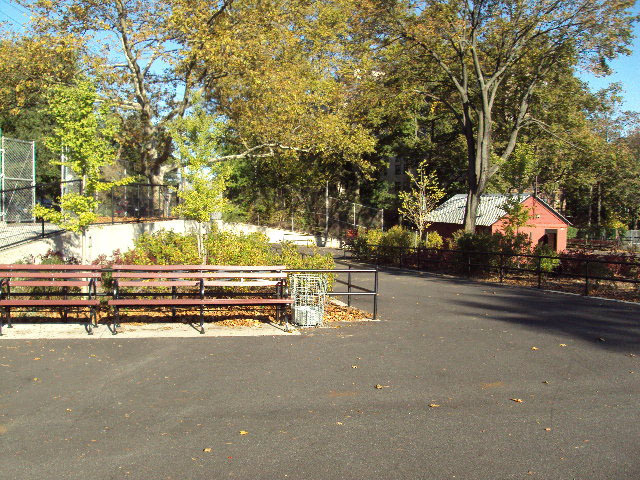 Though it planned to build a school on the site, jurisdiction was transferred to Parks three years later, and Mahoney Playground opened in 1939. More than 20 years later, in 1961, the New York City Housing Authority (NYCHA) acquired land adjacent to the property in order to build another playground for the Richmond Terrace Houses. 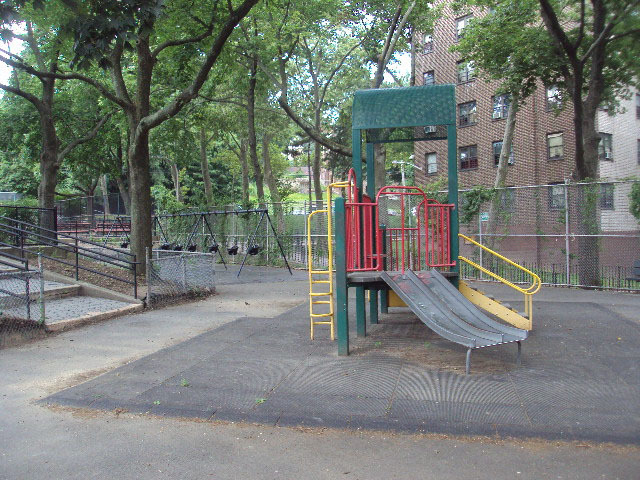 Five years later, the NYCHA ceded this playground, which contained a comfort station, landscaping, sitting areas, and assorted recreational facilities, to Parks. In 1992, the City Parks Foundation donated a total of $21,000 to Staten Island parks. A portion of this money was used to install safety surfacing under the slides, replace broken swings, and remove an old sandbox and monkey bar set in Mahoney Playground. In 1997, with the benefit of mayoral funds, the playground underwent a $240,000 renovation. New play equipment with safety surfacing, a new spray shower complex, refurbished handball courts, fences, and guide-rails were installed. Animal art, in the shape of a camel and a seal, as well as swings for toddlers and older children, benches, and a basketball court, were also added. Today, this park is noted for its many tiers, gardens, sitting areas and the wide variety of recreation it offers. Maple trees, oaks, and a flower garden offer green space and beauty in this heavily populated New Brighton neighborhood of apartments and mixed single-family Dutch revival, Federal and Victorian-style homes. Strategically placed benches, a blue, pink and red sprinkler system, jungle gyms, basketball courts, and swings and handball courts, provide the community with a place for gathering and recreation.